Do you agree with the AA? The AA wants poor road surfaces to be included in the hazard perception test because of the damage they cause to vehicles. It also called for advice on what to do when drivers encounter a pothole to be added to the Highway Code. One in five local roads in England and Wales is in a poor condition as councils face a huge funding deficit to tackle potholes, a recent report by the Asphalt Industry Alliance warned. Hazard perception is part of the theory driving test and involves candidates identifying something that would cause them to take action such as slow down or change direction in 14 video clips. The pass rate of the practical driving test fell to a nine-year low of 45% after changes to make the exam more realistic were introduced in December last year. A survey of a small sample of driving instructors found that the majority have broken down during a lesson at least once in the past 12 months because of pothole-related damage, and many have to adapt lessons to avoid certain roads where there are too many potholes. Some learners have even had to abandon a practical driving test because their car was damaged by a pothole, the AA was told. Damage to tyres, wheels and suspension are the most common problems. AA president Edmund King said: "It is a sad indictment of our poor road conditions that instructors are having to adapt their lessons to avoid potholed roads. "More troubling is the fact that lessons and tests are being abandoned because of pothole related breakdowns. "This is damaging to learners' confidence and to instructors; whose livelihoods depend on having a fit-for-purpose road network and an undamaged car. Drivers are being urged to photograph potholes and send them to the responsible highway authority and the Department for Transport to demonstrate the scale of the issue as part of the AA's #FlagitFunditFillit campaign. The Government said the DVSA keeps the driving test under constant review to make it as effective as possible. 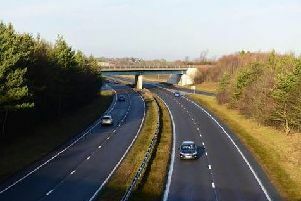 It said in a statement: "We have listened to the concerns of road users and are already providing councils in England with over £6 billion to help improve the condition of our local highways.